Families still watch together, groups of friends watch together, housemates, etc., etc. The TV is still, in many ways, our electronic campfire. This may be somewhat obvious, but it’s in contrast to a computer which is usually a one viewer situation. So the use case for a TV, generally speaking, is very different from a computer screen. To folks developing applications for iOS and Android this is a significant difference. I don’t think most people will use the TV as just another computer screen. It will still be a more passive experience and one where the group of people watching it will have to agree on any apps or widgets that are viewable on the screen. Many apps will probably be info strips (think ESPN scores running along the bottom of your screen) or pop-up boxes, more than full fledged apps taking over the entire screen. Although, I’m sure games will be significant as they are everywhere. For content creators, I think it matters a little less. However, if you’re creating content for the web it’ll make a difference if you think it’s likely to be viewed on a TV. That file that looks ok on a 17″ laptop screen may not look so hot on a 52″ TV. Is it a 60 second skit meant for youtube or a 10 minute episode of a regular program on blip.tv? The 10 minute episode is probably more likely to make it to a TV, and you’ll want to encode accordingly. Does this mean you need to re-encode and re-upload all your content? Well, if InterwebTV was here, right now, then yes you would. But it’s not. At least, not in any meaningful way. If your audience is technology geeks, then that day is probably not too far off. 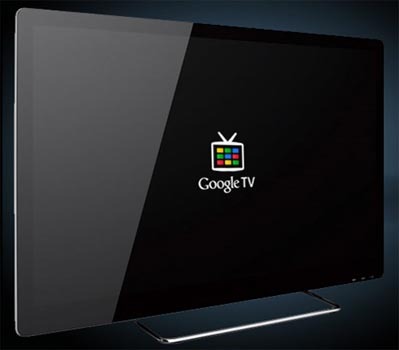 Tech people will probably have Google TV or some such thing sooner than everyone else. But if you’ve got a wider audience, you can’t listen to early adoptin’ tech folks. You’ll know TV via the net (or Over The Top TV) has arrived when your parents have it. This was my gauge for broadband and I think it’s more or less applicable here as well.